Barometric Trend ............ : Barometric pressure is steady. Precipitation possible within 24 to 48 hours. Data proudly brought to you by WOSPi and a very dedicated Raspberry Pi. System Uptime ....... : Running since Wed Mar 13 16:41:45 2019 LT.
40 day(s), 2 hour(s), 17 minute(s), 3 second(s). A PurpleAir PA-II Dual Laser Air Quality Sensor was installed in late 2017. The local air quality index can be checked here. Official measurements can be retrieved from luftkvalitet.info. Click to retrieve actual conditions. 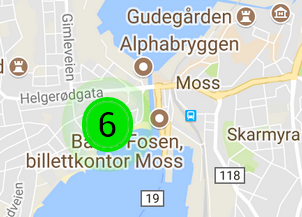 Nearby web cameras are provided by the Port of Moss and Moss Motorbåtforening. Please note that these cameras seem to have some reliability issues and may not always be available. Also, the camera feeds require a proprietary H.264 decoder (feel free to try talking Moss Havnevesen KF into publishing simple JPG images instead - for the benefit of the human race): Moss Havnevesen KF.